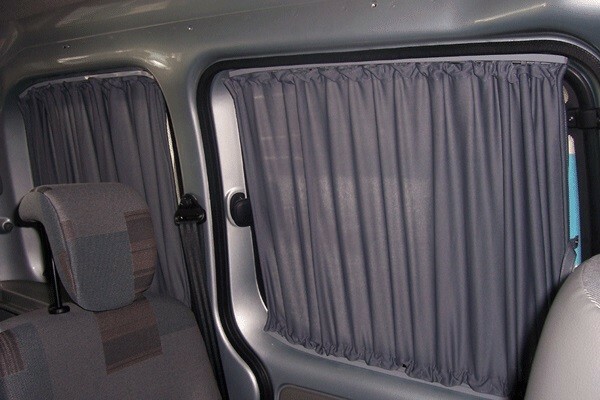 At Curtain-Tracks.com, we can supply custom-sized curtains, drapes and the associated hardware for any vehicle including buses, conversion vans, military vehicles, RVs and other specialty vehicles. For buses, we commonly provide custom windshield wrap around curtains (windshield drapes), curtains for windows, divider curtains and even shower and bunk curtains for creative uses of space. When it comes to bus curtains and drapery, safety and comfort are high priorities. We offer flame retardant fabrics including those that meet FMVSS 302 standards. Lining materials for improved blackout and insulation purposes are also available. These curtains can be crafted to use most replacement drapery hardware. These curtains are sure to meet the needs of anyone refurbishing or customizing a tour bus or converting a bus for use as an RV. We are your best source for bus curtains made to your exact needs. You can select from a number of different drapery hardware carriers commonly used in vehicles like boats, ships and yachts below. Looking for fabric? Our Shadow Cube fabric is most common for bus curtains.